Cong, W.-N., Chadwick, W., Wang, R., Daimon, C. M., Cai, H., Amma, J., . . . Maudsley, S. (2014). Amitriptyline Improves Motor Function via Enhanced Neurotrophin Signaling and Mitochondrial Functions in the Murine N171-82Q Huntington′s Disease Model. Journal of Biological Chemistry. doi: 10.1074/jbc.M114.588608. He, B.-R., Lu, F., Zhang, L., Hao, D.-J., & Yang, H. (2014). An alternative long-term culture system for highly-pure mouse spermatogonial stem cells. Journal of Cellular Physiology, n/a-n/a. doi: 10.1002/jcp.24880. Li, L., Candelario, K. M., Thomas, K., Wang, R., Wright, K., Messier, A., & Cunningham, L. A. (2014). Hypoxia Inducible Factor-1α (HIF-1α) Is Required for Neural Stem Cell Maintenance and Vascular Stability in the Adult Mouse SVZ. The Journal of Neuroscience, 34(50), 16713-16719. Li, Y., Korgaonkar, A. A., Swietek, B., Wang, J., Elgammal, F. S., Elkabes, S., & Santhakumar, V. (2015). Toll-like receptor 4 enhancement of non-NMDA synaptic currents increases dentate excitability after brain injury. Neurobiology of Disease, 74(0), 240-253. Semple, B. D., Trivedi, A., Gimlin, K., & Noble-Haeusslein, L. J. (2014). Neutrophil elastase mediates acute pathogenesis and is a determinant of long-term behavioral recovery after traumatic injury to the immature brain. Neurobiology of Disease(0). Apolloni, S., Fabbrizio, P., Parisi, C., Amadio, S., & Volonté, C. (2014). Clemastine Confers Neuroprotection and Induces an Anti-Inflammatory Phenotype in SOD1G93A Mouse Model of Amyotrophic Lateral Sclerosis. 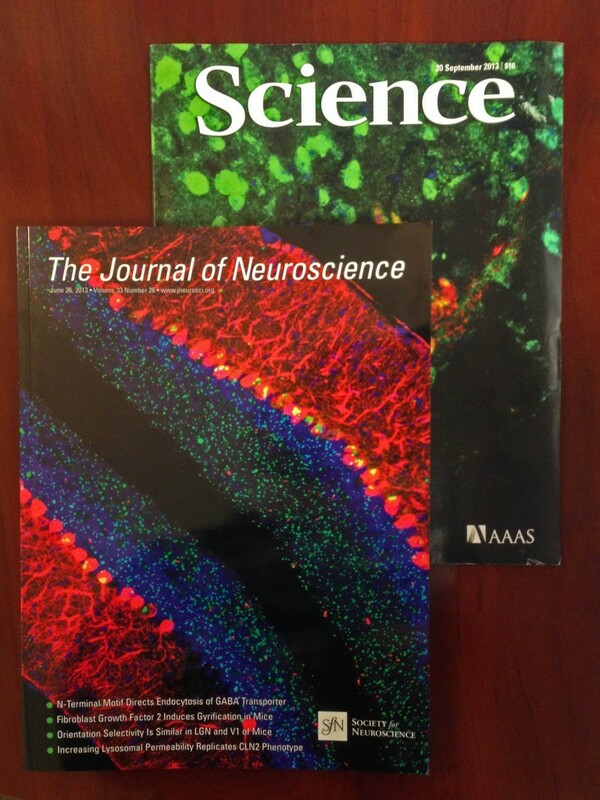 Molecular Neurobiology, 1-14. doi: 10.1007/s12035-014-9019-8. Grande, V., Manassero, G., & Vercelli, A. (2014). Neuroprotective and Anti-Inflammatory Roles of the Phosphatase and Tensin Homolog Deleted on Chromosome Ten (PTEN) Inhibition in a Mouse Model of Temporal Lobe Epilepsy. PLoS ONE, 9(12), e114554. doi: 10.1371/journal.pone.0114554. Hatanaka, Y., Hojo, Y., Mukai, H., Murakami, G., Komatsuzaki, Y., Kim, J., . . . Kawato, S. (2014). Rapid increase of spines by dihydrotestosterone and testosterone in hippocampal neurons: Dependence on synaptic androgen receptor and kinase networks. Brain Research(0). Hönigsperger, C., Marosi, M., Murphy, R., & Storm, J. F. (2014). Dorso-ventral differences in Kv7/M-current and its impact on resonance, temporal summation, and excitability in rat hippocampal pyramidal cells. The Journal of Physiology, n/a-n/a. doi: 10.1113/jphysiol.2014.280826. Matthews, D. W., Deschênes, M., Furuta, T., Moore, J. D., Wang, F., Karten, H. J., & Kleinfeld, D. (2014). Feedback in the brainstem: An excitatory disynaptic pathway for control of whisking. Journal of Comparative Neurology, n/a-n/a. doi: 10.1002/cne.23724. Murakami, G., Hojo, Y., Ogiue-Ikeda, M., Mukai, H., Chambon, P., Nakajima, K., . . . Kawato, S. (2014). Estrogen receptor KO mice study on rapid modulation of spines and long-term depression in the hippocampus. Brain Research(0). Patience, M., Zouikr, I., Jones, K., Clarkson, A., Isgaard, J., Johnson, S., . . . Nilsson, M. (2014). Photothrombotic Stroke Induces Persistent Ipsilateral and Contralateral Astrogliosis in Key Cognitive Control Nuclei. Neurochemical Research, 1-10. doi: 10.1007/s11064-014-1487-8. Tang, Y., Stryker, M. P., Alvarez-Buylla, A., & Espinosa, J. S. (2014). Cortical plasticity induced by transplantation of embryonic somatostatin or parvalbumin interneurons. Proceedings of the National Academy of Sciences. doi: 10.1073/pnas.1421844112. Thimm, A., & Funke, K. (2014). Multiple blocks of intermittent and continuous theta-burst stimulation applied via TMS differently affect sensory responses in rat barrel cortex. The Journal of Physiology, n/a-n/a. doi: 10.1113/jphysiol.2014.282467. Walker, C. L., Wang, X., Bullis, C., Liu, N.-K., Lu, Q., Fry, C., . . . Xu, X.-M. (2014). Biphasic bisperoxovanadium administration and Schwann cell transplantation for repair after cervical contusive spinal cord injury. Experimental Neurology(0). Zhang, W., Thamattoor, A. K., LeRoy, C., & Buckmaster, P. S. (2014). Surviving mossy cells enlarge and receive more excitatory synaptic input in a mouse model of temporal lobe epilepsy. Hippocampus, n/a-n/a. doi: 10.1002/hipo.22396. Posted in Customer News, Software and tagged citations, Neurolicda, Stereo Investigator.